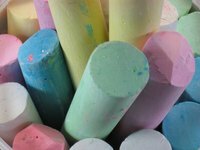 Making non-toxic sidewalk chalk is an easy craft project that you can do with all ages of children at home. By making sidewalk chalk available to your children, you will encourage them to play outside and be and express their creativity. Experiment with different molds and colors to create unique shapes and custom colors. To remove the sidewalk chalk paintings, simply hose the area down with a garden hose, or wait for a good soaking rain. Use duct tape to completely cover one end of any paper towel tubes you are using as a mold. Tape the tubes with duct tape in an upright position on a piece of card board. Measure 1 cup of the Plaster of Paris into the mixing container. Add 3/4 cup water to the Plaster of Paris. Add 2 tablespoons powdered or liquid Tempra paint to the mixture. Mix thoroughly with a stir stick or plastic fork. If the mix seems too runny, add a little more Plaster of Paris and mix again. Pour into molds and allow to dry. The drying time will depend on the size of the mold. Small molds can be dry in as little as an hour, while large molds may take 4-6 hours to dry. Remove the chalk from the molds. If the cardboard mold sticks to the chalk, dampen with a wet washcloth. For more intense colors, keep adding the powdered paint until you achieve the color you want. If using liquid Tempra paint, try swirling a second color into the mixture for a unique color. Plaster of Paris is non-toxic but is not edible. Do not pour plaster down your sink as it could cause your drain to clog. Do not use your hands to mix plaster as it sets up very quickly and tends to get warm as it sets.